As you try to determine the best time to skydive, you’d be remiss not to consider the weather. For many, skydiving is a special excursion. Whether it be a bucket list item, once-in-a-lifetime adventure, birthday gift, or a best friend bonding escapade for you and your fellow adrenaline driven compatriots, with something so grand, there’s a lot of pressure to get it right. Don’t worry, we understand. You want to make sure you pick the best time to skydive. So, in the land of great plains, pastures, and rangelands, just what is the best month to skydive in Oklahoma? 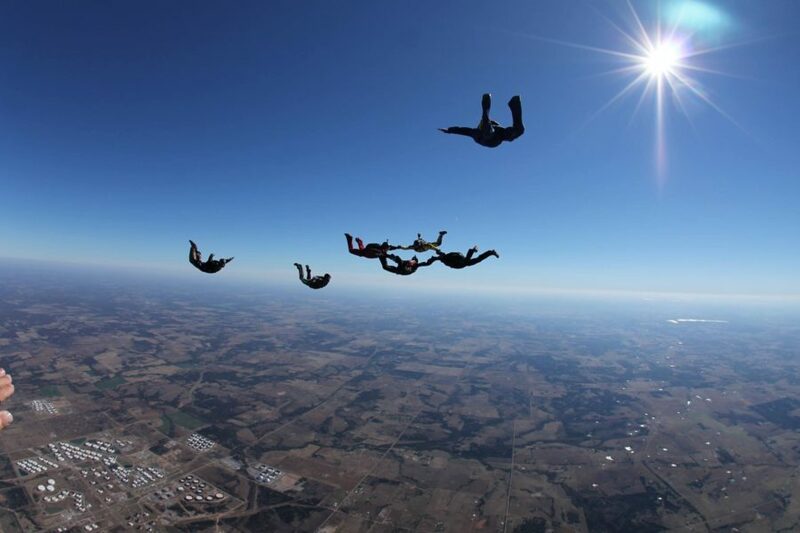 At Oklahoma Skydiving Center, we’ve got nearly 50 years of experience behind us. With that amount of experiential data, you can practically consider us experts on Oklahoma weather patterns, and you can certainly trust the intel we provide on the best month for skydiving in Oklahoma. 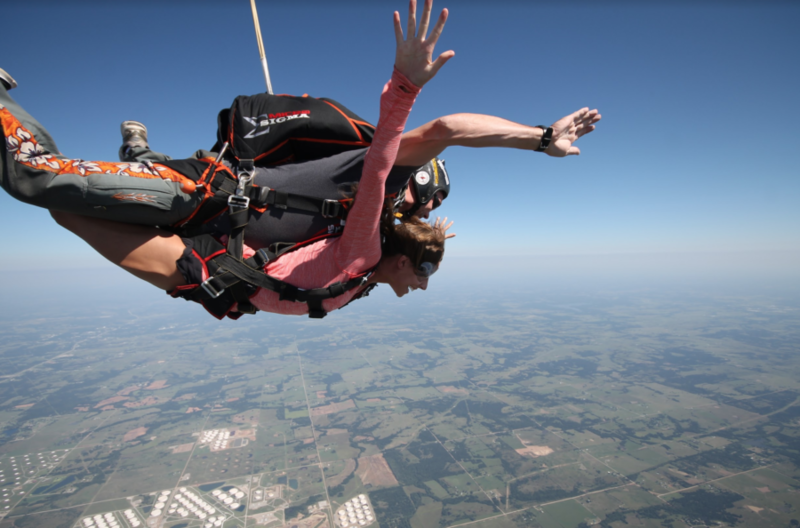 Who knows, even if you’re a long-time local, you might learn a thing or two about the best month in Oklahoma for skydiving! Interested? Well, keep reading for a general seasonal breakdown to help you decide the best time to skydive in Oklahoma, and our final conclusion on the best month for skydiving. Here in Cushing, Oklahoma, our spring season is fairly mild. The temperatures are typically cool but not cold, ranging from about 60 degrees Fahrenheit up to 70 degrees Fahrenheit as summer approaches. In the spring, we don’t see a great deal of rain, so it’s not likely for your skydive to be rained out. However, the caveat of the spring for skydiving is the increased wind speeds. When it comes to jumping, if the winds are consistent, we can keep jump operations rolling. If they begin to become gusty, for the safety of everyone involved, we may temporarily suspend jump operations. In general, in Cushing, Oklahoma, where we are located, the summers hang heavy across the land, hot and muggy from May until August. And you know what? These months are typically our busiest. After all, what better way to beat the heat, than by cooling off in freefall? Though, in the spirit of transparency, you should know these warmer months are also known for the appearance of regular summer thunderstorms. Sometimes, we get lucky. The skies go gray, threaten to storm, and then as if they caught another whim, just like that, they clear up. Other times, the clouds will deliver on their promise and we’ll have a shower, but shortly after, they pass right on through. When this happens, we resume jump operations as soon as the sky clears and it’s safe to go again. From what we can tell, summer is by far one of the most popular times to skydive. The heart of fall in Oklahoma is bright and crisp and not particularly wet or windy. At the very beginning, September, temperatures can still be found reaching toward the 80-degree mark. Once you move in to October and towards November, the temperatures you can expect to experience are much like the spring: typically, they are in the 60-70 range. All in all, in our opinion, the fall is a fine time to make a skydive. Our winter season typically lasts from December to February. We won’t lie, the winters here tend to be cold and windy, but we’ve seen several warm days appear out of nowhere! In the winter, you can expect to see temperatures hanging around 50 degrees Fahrenheit. Come prepared with a few layers, and you’ll be fine on your skydive! The state of Oklahoma is particularly vexed by Midwest twisters. Tornado season here peaks from April-June. After 50 years of providing skydiving services, we’re familiar with the brewing of the thunderstorm systems that produce tornadoes. We’ve got keen eyes, and we stay on the lookout during these times to ensure our staff and customers only go up in favorable conditions. So, what is the best month for skydiving in Oklahoma? While you can find us turning loads and getting jumpers in the air every Friday-Sunday year-round, from reviewing years of data gathered by the drop zone, we feel the best month for skydiving in Oklahoma is in July! Keep in mind, this is nearly the peak of the summer, so it’s bound to be busy! Where there is a will, there is a way. You decide the best time to skydive for you! Jumpers who aren’t interested in the bustling summer vibe can have just as pleasant of a time visiting our facility in the fall when the season begins to wind down or on a visit in the spring or winter. The experience is what you make it, and if you come with a good attitude, chances are you’ll have an amazing time on your skydive!